Gruepal is a module designed for the Drupal CMS that runs z-machine programs, most popularly text adventures and interactive fiction. Well known examples include games created by Infocom, inventors of the z-machine, such as the Zork series, Hitchhikers Guide to the Galaxy, The Lurking Horror, Planetfall, etc. 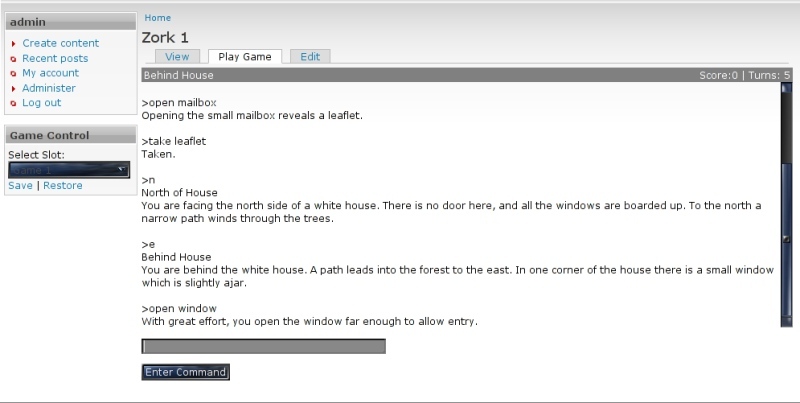 Gruepal is not limited to games created by Infocom though – currently running games written in versions 1-3 of z-code, the goal is to implement all 8 versions of z-code, which would support many games found within the Interactive Fiction Archive. Gruepal is currently closed source (it’s a personal project for now, I have a lot of enjoyment working with it). The plan is to have a site demoing the module during later alpha/early beta stages (coming up soon, development has gone well), then release the module to the Drupal community as open source.